All of us have seen a comment box on various websites. 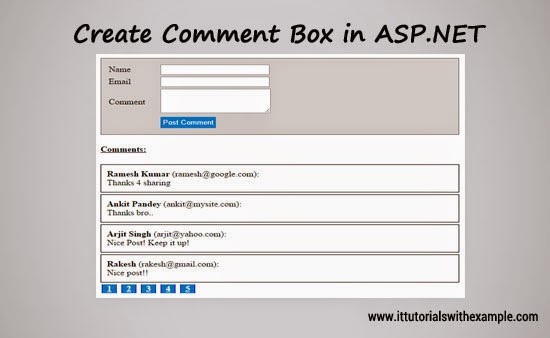 In this Post, we will learn how to create a Simple Comment Box in ASP.NET. For demonstration, I have created a database (named as Database). The following is the table design for creating tbl_Comment. 1. 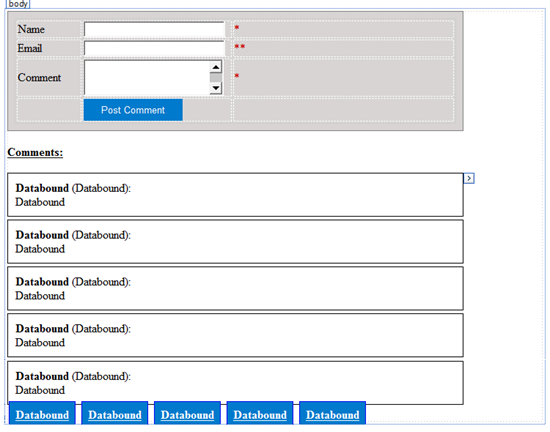 Create an Empty ASP.NET Website and Add a Web Form (Default.aspx) to it. 2. Inside of div tag, create a table with 3 columns and 4 rows. 3. Drop the Label control and TextBox Control in the first and second column. Change the TextMode property for the Comment TextBox to MultiLine. 4. Add RequiredFieldValidator for all TextBox in the third column. Add another validation i.e. RegularExpressionValidator for txtEmail TextBox. 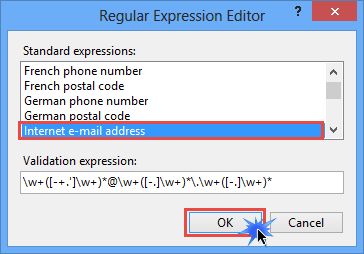 Set the Validation Expression to Internet e-mail address. 5. Drop Button Control and Set Id as btn_Submit and Text as Post Comment. 6. Drop two Repeater Control after the table tag. One for displaying the comments and other for displaying paging. Style="padding: 8px; margin: 2px; background: #007acc; border: solid 1px blue; font: 8px;"
Hope you like it. If you have any query comment it below. Thanks. the name of that function on the submit buttton click , at the end . Cannot insert the value NULL into column 'Id', table 'Database.dbo.tbl_Comment'; column does not allow nulls. INSERT fails. you need to provide "auto generate id" functionality to ur Id column as it is primary key. because you are not providing any value to Id, it is showing error as it cannot be left null. the name "Repeater1" does not exist in the current context. the name "nametxt" does not exist in the current context. the name "emailtxt" does not exist in the current context. the name "content" does not exist in the current context. Great article.I agree with your all points.Children should be treated with love and affection.Parents should be have friendly attitude and equality should be there.Thank you for sharing. Thank you...But my posted comments are not displaying.